A classic American bed form rooted in its Shaker tradition with modern Danish touches. Its hand planed faceted posts and carved accents mark its handmade character up close. After much development, its joinery design allows for both a clean contemporary post without the conventional exposed bolt holes, yet retain immense strength and lightness by using embedded steel bed bolts through each connection. 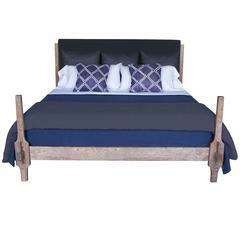 Solid reinforced poplar planks support the mattress evenly. Box spring not needed, though can be used. Zietz Furniture is the work of Jeremy Zietz, a studio furniture maker & product designer based in Richmond, Virginia. He has a comprehensive background in product design, a masters of fine arts, and training from masters in traditional furniture making. Zietz Furniture is the product of his sense of contemporary design, innovation in sustainable product development & his deep passion for exceptionally well crafted solid wood furniture. His passions have lead him to specialize in heirloom furniture destined to become long-lasting gifts to future generations.